2015 is almost over and it's time to summarize which books I've read this year. This year I wanted to learn more about Artificial Intelligence, so the list includes several books with that theme. I'm keeping track of the books through my Goodreads account, so don't feel sorry for me that it took a long time to complete the list, because it didn't! 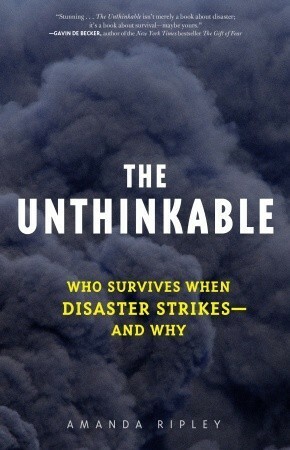 If I would recommend a book, I would recommend The Unthinkable: Who Survives When Disaster Strikes - and Why. As the title reveals, it is all about disasters and how to increase your chance of surviving a disaster and the psychology behind it all. The first story is about an unfortunate woman who almost died in the first Word Trade Center attack in New York, and a few years later she was in one of the towers when the second attack happened. Even though she was responsible for the evacuation of the floor she was working on, she blacked out and forgot all about it until a few weeks later when she remembered that "Hey, maybe I was the one responsible for getting everyone out of the building." Another story is about the passenger ferry Estonia which sank during a heavy storm. One of the survivors recalled that when he escaped he walked past several passengers who just sat in chairs in a bar very close to the life boats. They could have survived but they just sat in the chairs doing nothing at all. So who is surviving a disaster? The answer is that one part of it is based on your life history. If you have lived a rough life it will increase your survival chances. Another answer is that you have to prepare so you don't black out and be aware of the "stupid" mistakes. One stupid mistake many people do in a disaster is that they look at what other people are doing. So instead of evacuating the burning World Trade Center, many people just stood there looking at what other people were doing who were also looking at what other people were doing. So they didn't escape when they could! Those who had practiced evacuating the buildings escaped as soon as possible and survived.